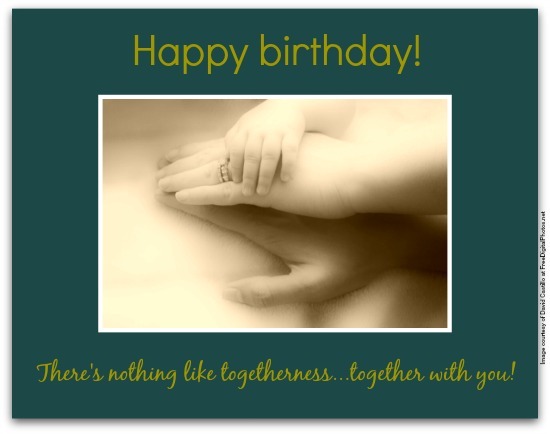 You'll know instantly when you find the right sentimental birthday wishes for your loved ones. Click your way to the sweet birthday messages below and you'll know even sooner. 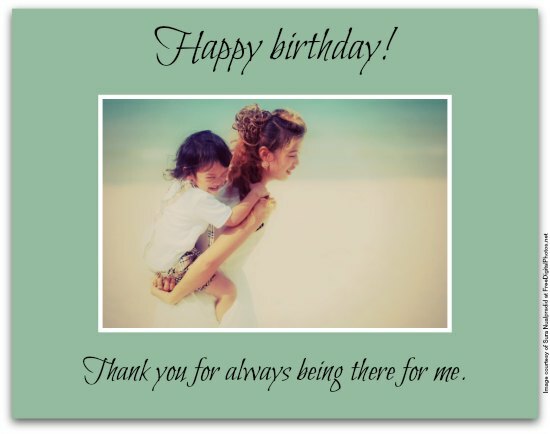 What makes sentimental birthday messages so sentimentally perfect? It's the ability to invoke the sentimental feelings of the birthday girl or girl, whatever his or her age. Sentimental feelings come in many shapes and sizes, just like the sentimental people expressing them, but if you had to narrow down these emotions to three, you would end up with love, compassion and nostalgia. Birthday wishes worth their weight in sentimentality have these ingredients, like the ones here. The most important, most life-changing lessons I've learned come from only one source: you. You are my true mentor, my life coach. I'm awed and inspired by your kindness, wisdom and love. Happy birthday! May you always groove to the sweet sounds of life, love and family, especially on your birthday! On your birthday, blow out all your candles and be sure to make a wish for each and every one! This year, they all come true. Happy birthday! There are some things people just won't tell you about yourself. I'm not one of them. I think you need to know how incredibly wonderful you are. Happy birthday! Even though we do not see each other every day, I want you to know that I'll always be there for you...just like you've always been there for me. Happy birthday! The best for you is not good enough. You deserve everything you've ever wanted and much, much more! I designate this birthday of yours as the first day of getting what you want out of life...and me! Sentimental birthday wishes just keep coming! You're a little piece of my childhood that will always be with me — in body and spirit. I’m so glad I have someone like you in my life. May we share and make many more memories together, starting on your birthday! Thanks for being there for me through the years. You’re the best. Happy birthday! Together, we've embarked on some incredible adventures, sharing thousands upon thousands of wonderful moments that given us unforgettable memories. I'm so happy you're a big part of my life! Happy birthday! Through every smile, every tear, every laugh, every mistake, every victory, every moment, you've been there for me. Happy birthday! Happy birthday and thank you for every great memory we have made together and you've inspired. Happy birthday! Happy birthday. Every year, you just get sweeter and sweeter, spreading your love and light without thinking twice about it. You're so sweet that you're now serious competition for my mother (don't tell her I wrote that). To get in the mood to pick the right sentimental birthday wishes, take two minutes from your busy life to listen to Doris Day sing Sentimental Journey. You'll find the song and lyrics right here. You're simply a gift from God. There’s no other way to put it. You must have been an angel in another life! Now it's my turn to give you a beautiful gift: my love. Happy birthday! Thank you for finding a crack in my trials and tribulations to shine a ray of light into my life with your bright outlook and brilliant spirit. Happy birthday! Happy birthday! I’m so blessed to have you in my life. Through the years, through thick and thin, you've been so wonderful to me. May your special day be a celebration of your own special brand of wonderfulness.